Re: It's Tuesday...post your badgers! Great shot Rik! Here's one of the Slough Creek badger babies. Found the badger hole in a draw behind the SC campground, Rik, several years ago. I hid behind a tree so I could get some pix without disturbing the family. The baby had been repeatedly, poking its head in and out of the hole . It probably was curious wondering who that big, overgrown Uinta was, who was standing behind the tree with the weapon (camera lens). Got off a few shots when mama badger suddenly poked her head out of the hole, too. I could tell by the expression on her face that she was plenty annoyed with me so I left immediately and began walking back to our campsite. I was in the rear parking area when I caught a glimpse of mama, out of the corner of my eye. She was in the meadow. When she saw me, she chased me all the way back to our trailer and stood in front our trailer door for at least 30 minutes. She obviously was waiting for me to come out, so she could take a big chunk out of my leg. The fierce look on her face reminded me of your first pic, Rik. Since that encounter I've developed a great appreciation for badgers and how fierce they can be. I was no where near that den hole but mamma knew that I was somewhere in the campground area and, apparently, decided to teach the interloper a good lesson. And she did. Last summer, we had a badger that was hunting in our site almost daily. But this time, it it had a hunting partner...the SC red fox. That was the first time that I had ever seen a fox and a badger hunting together. Unfortunately, I didn't get any shots of the unique encounter because I was too busy trying to hide in our trailer A Uinta had crawled under the flap of our screen tent (where I was sitting in a lawn chair) and the badger was in hot pursuit of the Uinta. The minute the badger poked its nose under the tent flap, I yelled "Don't even think about it, Buster, and then I ran to our trailer. Lucky for me, I wasn't injured in either badger encounter. But because I could have easily been injured, I now stay away from badgers and photograph birds, ducks and waterfowl instead...much safer. IMO, badgers are more dangerous than bears. Badgers are smart, cunning, unpredictable and can be absolutely ferocious if they sense any kind of danger. And, although they may look like a slow-moving animal, in reality, they're exceptionally fast and quick on their feet and can turn on a dime, without warning. Mama Badger taught me a lesson that I've never forgotten. So, I urge everyone to be very careful and cautious, whenever you see a badger. They have my full respect. And for your own safety, I hope that they'll have yours. I love Badgers! 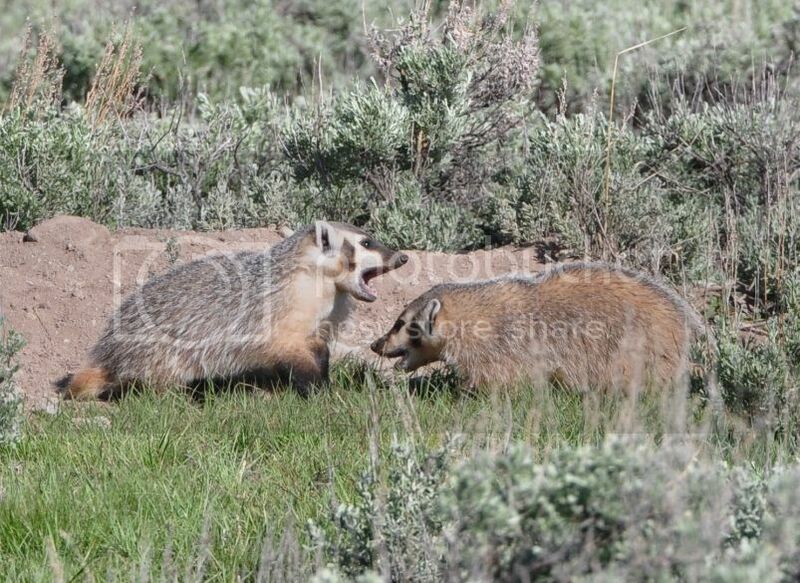 2012 Near Blacktail Plateau, badger babies! LOL! My shot was from that same hole at the same time! 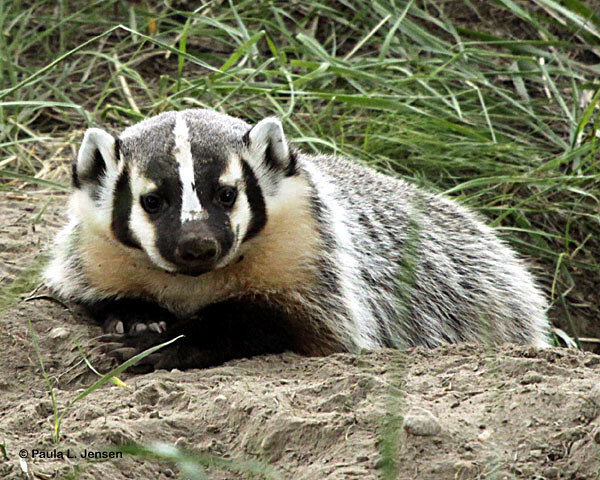 I have not seen a badger in so long,but I have stepped in a lot of badger holes and I apologize to all badgers for my disparaging remarks .I wonder if I am in the park too early or too late as I have only seen them June or later ? Lol there were a few photographers there that day, it was my first ever badger sighting and I was a tad excited. Usually I'll see badgers in the Park from early June to mid-July. After a mother has newborns, she often moves them to new a den, almost on a daily basis, to protect them. The thing that I find so interesting is that the youngsters take part in the digging of the new den holes. I've got a number of pix that I took awhile back, that shows a young badger digging a new hole. The youngster was covered from head to toe with fresh, dark brown dirt...even its face. Mama was likely conducting her annual Baby Badger "101 digging class" and was showing the youngster all the best places to dig holes, exactly how to dig them and how to make connecting holes and tunnels so they'd be able to come and go, quickly and freely to the den, without being detected. 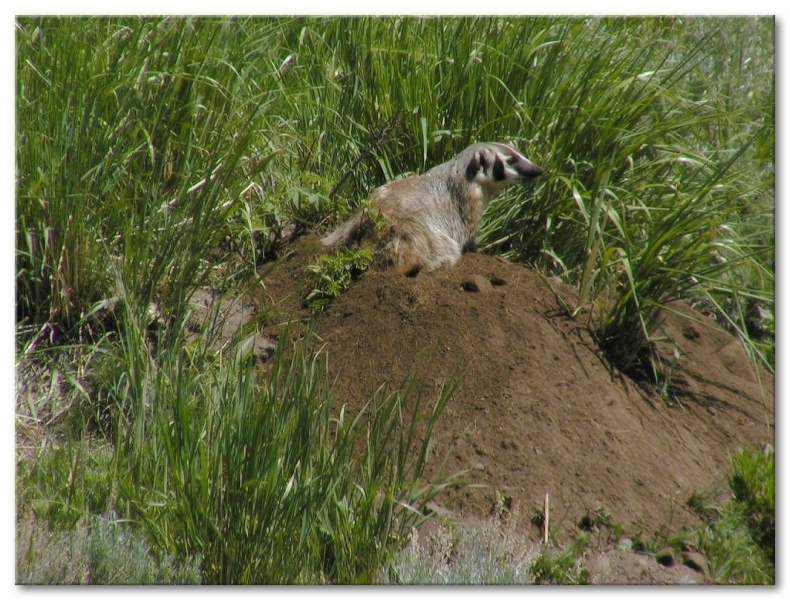 Badgers seem to prefer dry rocky sagebrush areas when building their den sites. I usually look for mounds of dug-up soil that has tall blades of bunch grass behind it. 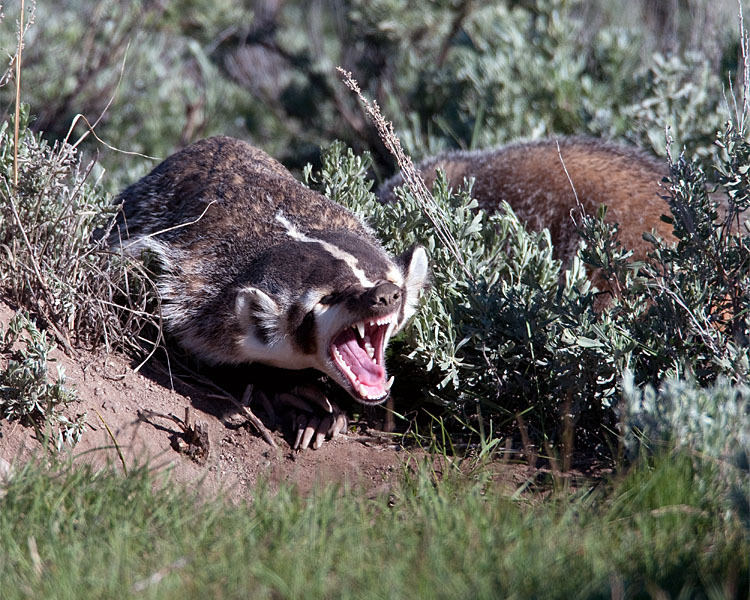 The den hole is, usually, located directly in front of the tall blades of bunch grass or sometimes under a tall sagebrush bush. Both make an excellent natural ground cover for the badger's den entrance, so mama can deceive predators and any person who ventures too close to the den. When it comes to a wildlife mother protecting her young, a badger mother, like most/all wild mothers, is totally non-partisan. She'll go after anyone who gets too close to her young. Doesn't matter if you're a pro photographer, a naturalist, a park ranger, hiker or a wildlife enthusiast. And it doesn't matter if the encounter was intentional or accidental. Wildlife mothers don't care. All they care about is protecting their offspring. I used to love photographing badgers of all ages. 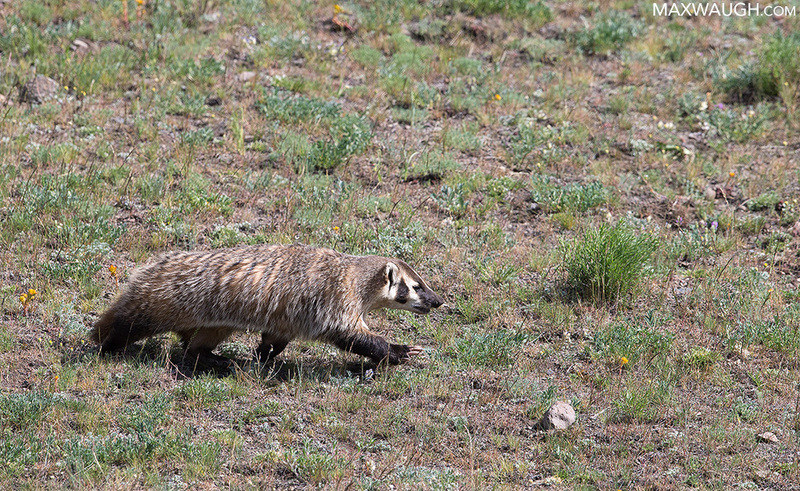 But with so many other Yellowstone critters to photograph, I'd much rather leave the badgers alone, no matter how cute or innocent they may appear.